A sow grizzly bear spotted near Camas in northwestern Montana. Wildlife officials endorsed a plan in August to keep northwestern Montana's grizzly population at roughly 1,000 bears as the state seeks to bolster its case that lifting federal protections will not lead to the bruins' demise. 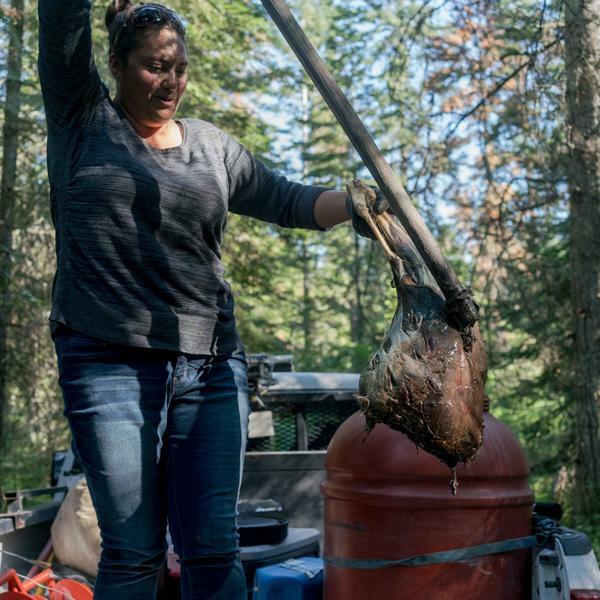 Kari Eneas, a wildlife biologist for the Confederated Salish and Kootenai Tribes, fishes a deer leg out of the "bait bucket" in Montana's Mission Valley. Lisa Schmidt (right) and her daughter Abby Hutton (left) at the Graham Ranch near Conrad, Mont. Grizzlies have killed livestock on their ranch. The grizzly population in this area, known as the Northern Continental Divide Ecosystem, is growing at about 2.3 percent a year. Bear biologists estimate there are more than 1,000 bears here, inhabiting an 8 million-acre swath of land encompassing Glacier National Park and numerous national forests. It is the largest grizzly population in the continental U.S. The grizzly has been federally protected since 1975, but last year the Trump administration took a different population of grizzlies — the Greater Yellowstone grizzly — off the endangered species list, arguing that the population had recovered. The first grizzly hunt in the lower 48 in decades was slated to begin in Idaho and Wyoming on Sept. 1. But last week a federal judge in Missoula put a temporary, two-week hold on the hunt. The judge is considering a number of lawsuits challenging the decision to remove federal protections from the Yellowstone grizzlies. A decision to de-list the Northern Continental Divide Ecosystem grizzly is expected by the end of the year. The judge's decision in the Yellowstone grizzly case could shape the way officials proceed in Montana. Regardless, if a decision to delist in Montana is made, the government is likely to face a slew of lawsuits. Keith Hammer is chair of a Montana wildlife organization called Swan View Coalition. He says those federal protections are crucial to managing the population of bears around Glacier. "It will unwind so fast it will make your head spin if they remove Endangered Species Act protection," he says. Kari Eneas is a wildlife biologist for the Confederated Salish and Kootenai Tribes on the Flathead Reservation in Northwest Montana. She's one of a group of researchers and game officials learning how to keep bears alive and how to mitigate confrontations between bears, cars and ranchers. Standing in the back of a pickup truck, she's stirring a curdling stew of severed deer legs in a big, red plastic bucket. The stew will become bait for a grizzly. "Well I've been tracking the stages of the bait barrel and there was one stage that I deemed sulphurous and I think this has ... kind of got a hint of old shoe?" She fishes a smelly roadkill leg out of the barrel and places it in a giant metal cylinder. Stinky sneaker to us, the odor signals a tasty treat to a grizzly. Eneas hopes a bear will crawl in here to get its snack, and then the device will slam shut, trapping the grizzly inside. Eneas and her co-workers will sedate the grizzly, slip a high-tech collar over its neck and let it go. "With the collar data, we can get GPS locations," Eneas says. With this data, biologists can start to figure out where the bears are crossing roads, and why more bears than ever before are being killed by vehicles. In a normal year in this area, there are three bear deaths on roads. This year already there have been 10 killed, and another four cubs euthanized or relocated. Montana's transportation department has built dozens of "crossing structures" or underpasses that allow wildlife to safely get to the other side. But what researchers are finding about bear movements is striking. "We're seeing a lot more females going west across Highway 93 with cubs, and they're not using crossing structures," says Stacy Courville, another wildlife biologist for the Confederated Salish and Kootenai Tribes. Highway 93 shoots north from Missoula up to Flathead Lake and Glacier National Park, both major tourist attractions. The bear population is growing here, but so is the human population. For each of the past four years, Glacier saw its most visits in history. Tourism is driving millions of dollars into the Montana economy. But it's also driving people into bears. "It's really not that unexpected," says Hilary Cooley, the grizzly bear recovery coordinator for the U.S. Fish and Wildlife Service. "Because our distribution is expanding, the number of bears is growing. We would expect mortalities to grow in proportion to that too." Cooley says the population around Glacier National Park, which contains an even larger number of bears than the Yellowstone area, is healthy and strong. She says they are hoping to complete an evaluation of whether delisting is warranted by the end of the year. If these are removed, the state will manage the bear population. She says state officials are best suited to manage conflicts as the bear's range expands. "More and more farmers and producers are experiencing bears that they haven't been for many years," Cooley says. Lisa Schmidt is a rancher in the plains east of Montana's Rocky Mountains. She lives in an area about 50 miles from the sprawling Bob Marshall Wilderness. But out at her ranch, she's surrounded by plains and rolling hills, not mountains. One day, about seven years ago, she lost more than a dozen animals to a grizzly. "I walked down to the corral at about 5 o'clock in the morning, and there were dead sheep laying everywhere," she says. To bears, sheep are like little potato chips, dotting the plains. Last year, a Montana board that compensates ranchers who lose animals to large predators doled out more money than they ever have for grizzly kills. The land around Schmidt's ranch is all used for agriculture. She says she never expected to deal with bears when she moved to this area. "I was thrilled with the prairie and the coulees, and the different vegetation, which of course bears like," she says. Grizzlies feed off apple trees and dog food left out on the porch. They curl up in the shade of trees around homes. They rip doors off enormous grain bins. They'll even take chunks out of cornfields. A little over a year ago, another grizzly showed up right outside Schmidt's front door. She scared the bear off, but Schmidt's family remembers the incident well. "That was really scary for me and I didn't like that," says Schmidt's daughter, Abby Hutton. "And since then, she doesn't wanna camp, she doesn't wanna be outside," Schmidt says. "That's what makes me mad, is when my daughter's scared to go outside because there's too many bears wandering around." She thinks, if delisted, more strict management of the grizzly population – including limited hunting — can give her some peace of mind. "There's a place for grizzlies," she says. "It's just not in my yard." Wesley Sarmento, a Montana Fish, Wildlife and Parks bear management specialist, helps agricultural producers in Schmidt's area get along with grizzlies. "Ranchers and farmers often get pegged as anti-bear or anti-wolf," he says. "But that's really not the case. It's not black and white." In fact, a sow and two cubs live on the other side of Schmidt's property. She's OK with those grizzlies, she says, since they're scared of people. They keep mostly to themselves. Since the grizzly attack, Schmidt has gotten guard dogs to help scare bears away. Sarmento expects to help install electric fence around her corral in the coming weeks. So even if takes some change, Schmidt and her daughter recognize they'll have to learn how to live with bears out here on the prairie. This summer, the Trump administration decided to remove Endangered Species Act protections for Yellowstone grizzly bears. They spent more than four decades on the threatened list, and now the government says they are safe. 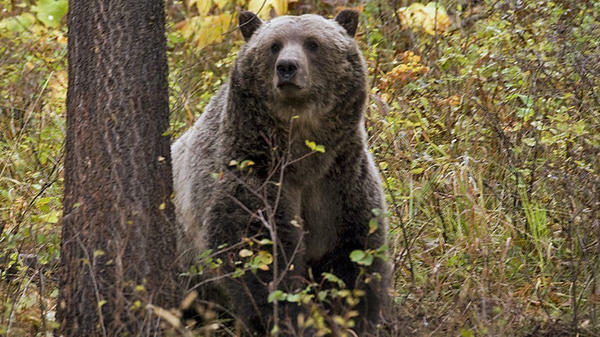 The Montana state government wants to take an even larger population of grizzlies off the list, saying they cause huge amounts of damage to crops and livestock. Montana Public Radio's Nick Mott has this snapshot of life in grizzly country. NICK MOTT, BYLINE: Kari Eneas is standing in the back of a pickup truck stirring a curdling stew of severed deer legs in a big, red plastic bucket. KARI ENEAS: Well, I've been tracking the stages of the bait barrel and, you know, there was one stage that I deemed sulfurous. And I think this has kind of got a hint of old shoe. (Laughter). MOTT: Eneas is a wildlife biologist on the Flathead Reservation in Northwest Montana, and she's re-baiting a grizzly trap. She fishes a smelly roadkill leg out of the barrel and places it in a giant metal cylinder. Stinky sneaker to us, this odor signals a tasty treat to a grizzly. Eneas hopes a bear will crawl in here to get its snack, and then Eneas and her co-workers will sedate the grizzly, slip a high-tech collar over its neck and let it go. ENEAS: With the collar data, we can get GPS locations. MOTT: With this data, biologists can start to figure out where the bears are crossing roads and why more bears than ever being killed by vehicles. In a normal year in this part of Montana, there's three bear deaths on roads. This year, there's already been 10 killed and another four cubs euthanized or relocated. HILARY COOLEY: It's really not that unexpected. MOTT: Hilary Cooley is the grizzly bear recovery coordinator for the U.S. Fish and Wildlife Service. COOLEY: Because our distribution is expanding, the numbers of bears is growing, we would expect mortalities to grow in proportion to that, too. MOTT: There are about a thousand bears here in the Northern Continental Divide area around Glacier National Park, and it's the largest grizzly population in the Lower 48. The animal's been federally protected since 1975. But Cooley says the population here is healthy and strong, and she expects a push to remove those protections by the end of the year. That will likely result in another round of lawsuits against the government claiming these bears still need protections. Still, Cooley and others believe state management instead of federal is best suited to mitigate conflicts as the bears' range expands. COOLEY: More and more farmers and producers are experiencing bears that they haven't been for many years. 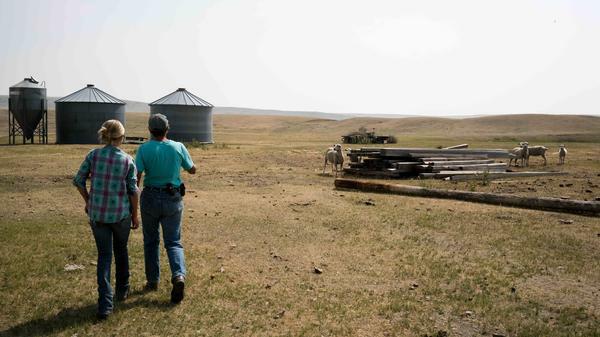 MOTT: Lisa Schmidt is a rancher in the plains east of Montana's Rocky Mountains, and she's seen what grizzlies can do. LISA SCHMIDT: I walked down to the corral about 5:00 in the morning, and there were dead sheep laying everywhere. MOTT: To bears, sheep are like little potato chips dotting the plains. Last year, a Montana board that compensates ranchers who lose animals to large predators doled out more money than they ever have for grizzly kills. The land around Schmidt's ranch is all agriculture - fields and prairie - and bears love it. They rip the doors off enormous grain bins. They'll even take chunks out of cornfields. A little over a year ago, another grizzly showed up right outside Schmidt's front door. She scared the bear off, but the incident is remembered well. Here's Schmidt's daughter, Abby Hutton. ABBY HUTTON: That was really scary for me, and I didn't like that. SCHMIDT: Since then she doesn't want to camp, she doesn't want to be outside. That's what makes me mad, is when my daughter's scared to go outside because there's too many bears wandering around. MOTT: She thinks, if delisted, more strict management of the grizzly population, including limited hunting, can give her some peace of mind. But how that delisting decision comes about may rest in the hands of the federal judge in Missoula deciding the fate of Yellowstone grizzlies. Last Saturday, a grizzly hunt was slated to begin in Idaho and Wyoming, but now that's been put on hold while the judge weighs both sides.